Survey: Would you like to see us write more articles about cruise etiquette or passenger behavior(s) on the cruise ship? We decided to write a list of 100 things or ways people annoy their fellow cruisers on a cruise ship. Check out one of our newest posts for a laugh or to frown with us at the ways of some other people. 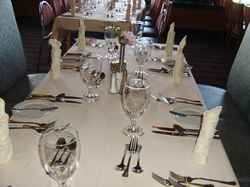 Buffets are a common place for many cruisers to grab a bite of food. Have you ever seen someone do something nasty or gross in the buffet to contaminate the food by accident or on purpose? In this article the webmaster of RyG's Cruise Guide will share some important things not to do in the cruise ship buffet. On each cruise you can always find passenger passenger that is rude, weird, or not normal. Here are some of my observations from my Carnival Dream cruise to the Bahamas. Our newest cruise etiquette related article is a little different. This time instead of giving straight tips on how to act I share some of my personal stories that inspired me to write cruise etiquette articles. Have you ever seen someone steal a wheelchair? Or maybe do some as minor as waste food? In this article I discuss some of the things that I have witnessed onboard the cruise ship that irritate me. Are you wondering what behavior you should and should not do in the main dining room? This article will give some Do's and Do Not's of the main dining room that come from experiences that I have seen or thought of happening. Check this out and next time you are in the main dining room be on the look out for people who break the Do Not's!